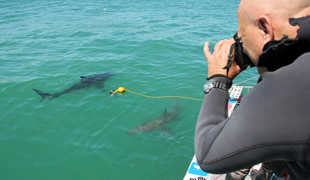 The only programme offering the chance to work with great white sharks at Dyer Island, Gansbaai, the white shark capital of the world. The unique programme developed by the Trust with Dyer Island Cruises and Marine Dynamics Tours offers the opportunity to combine practical boat– and shore-based research experience with scientific learning monitored by our full-time marine biologists. This allows the strictly limited number of Research Interns to maximise the value of their time spent on the programme. Wherever possible each Intern’s personal research goals are accommodated within the programme. The Trust and its eco-tourism partner, Marine Dynamics Tours, has developed a unique photographic record of thousands of dorsal fins of Great White Sharks allowing the identification of individual animals. This will now be incorporated in the worldwide database being developed by Bristol University, UK. Further on-going research projects include the tagging of African Penguins to study their feeding habits and ranges as well as studies looking at their breeding habits. These results are being used to inform decisions about the development of marine protection areas. We assist with other studies on the large colony of Cape Fur Seals; the Southern Right whale and the dolphin population. We also provide a rescue service for birds, seals and marine animals in the area.